No great detail on this one. Infact, about as scientific as a dollar store calculator. The fact of the matter is, I got a great deal on AR PR-220 12 g cable. So, I bought 2- 10 foot strands with gold plated AR banana plugs. I love AR. For my gear, they give me great results and I use the Pro Series for all of my analog connects. There is no fairy tale ending for this AR cabling I'm afraid. I've had Ultralink Challenger-2 cabling hooked up for at least 2000 hours now. I just wanted a change, problem is, I got a bad change. The AR sounded wicked flat. I can't make a proper comparison because the UL is burned in and settled so nicely, it mercilessly destroyed the AR. To say the least I packed up the AR w/ plugs and sold it to a mate for a steal. Suffice it to say, I have quite an attachment to my Ultralink. It's fantastic stuff, and Canadian of course. I guess I didn't realize just how much I loved it, and just how great it sounded until I pulled in some fresh stuff. All my cables are with gold plated AR banana plugs. I can't have it just the wire ends! Yes I prefer termination as well dak. 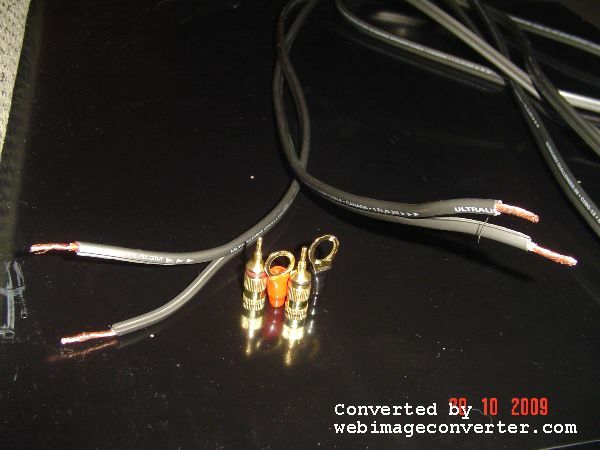 Quite a few cable manufacturers will actually suggest bare wire when possible. 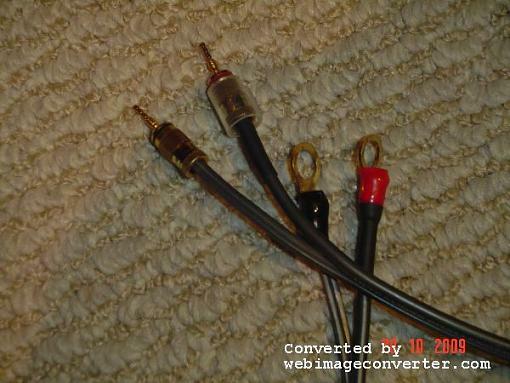 My problem is my current amp will not house plugs, I have to use pins. The speakers have posts with screw-on nuts, for these I have ring style connection. I always use heat shrink to seal up everything really good. What kind of cabling have you got dak? With all those speakers you must have quite a bit. A guy like you could benefit by dropping a couple hundred on a full roll. Hey Pchub next time check out solid core cable if you want to hear some great music. Tara Labs Prism wire is a nice solid core choice. I only replaced mine because I had a $1000 pair of Synergistic Research cables fall into my life. Nice difference there for sure.